During the Steelers post Super Bowl XLV rebuild deserve some well earned criticism for misfiring when drafting at linebacker and in the secondary. Artie Burns, Jarvis Jones, Shamarko Thomas and perhaps Bud Dupree all provide prime examples. However, the same cannot be said for their use of premium picks on the defensive line. So heading into the 2019 NFL Draft the question is whether Pittsburgh’s dynamic draft duo should do what they’ve done best on the defensive side: Look to the defensive lineman. Let’s take a look. 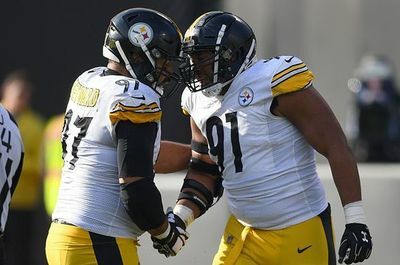 In the years since, Cam Heyward has not only developed into one of the league’s best defensive lineman and someone who is leader on the field and off the field. Although statistics fail to capture much of what Cam Heyward does on the field, one number stands out: 45. That’s 45 sacks Cam Heyward has amassed all before hitting age 30. To put that in perspective, Greg Lloyd had “only” registered 43 sacks before turning 30. Playing opposite Cam Heyward is Stephon Tuitt, who the Steelers drafted in the 2nd round of the 2014 NFL Draft out of Notre Dame. Stephon Tuitt is a player in the mold of Cam Heyward, who has gotten better each year and currently has 20 sacks to his name and he hasn’t even turn 26. Rounding out the Steelers starters at defensive line is Javon Hargrave. The Steelers drafted Javon Hargrave in the third round of the 2016 NFL Draft, and Hargrave immediately became something of a unicore in John Mitchell’s system: He cracked the starting lineup as a rookie. Due to the Steelers de-empahsis on of their “base” 3-4 defense, Hargrave’s opportunities declined a bit in the 2nd half of 2017. However, a strong performance against the Jaguars led Steelers coaches to look to work Javon Hargrave into their starting line up. Behind their starting front 3 the Steelers have Tyson Alualu who brings the team a versatile presence that can be counted on to step up either position along the defensive line. Although he saw reduced playing time in 2018 thanks to the health of the starters, Tyson Alualu recorded 4 sacks in 2018. Beyond Alualu, the Steelers also have Daniel McCullers, whom they drafted in 2014 in the 6th round whose presence at this point is a surprise to many. New defensive line coach Karl Dunbar took McCullers on as some sort of a project in 2018 and the Shady Tree showed enough to earn a 3rd contract from the Steelers. The Steelers also have defensive lineman Winston Craig, Conor Sheehy, Lavon Hooks and Casey Sayles under contract. At first blush investing anything more than a 6th round pick in a defensive lineman might seem like a luxury the Steelers cannot afford in the 2019 NFL Draft. Let’s start with the Steelers defensive line itself. Officially the Steelers are still a 3-4 team, but they play in their base defense so infrequently that Cameron Heyward is now listed as a defensive tackle instead of as a defensive end. While the Steelers pure need for a defensive lineman might be low, a legit “edge rusher” to work opposite T.J. Watt could give Pittsburgh’s defense a real shot in the arm. Now such an “edge rusher” has traditionally been an outside linebacker, but given the way positions are evolving in the NFL, that could also be someone considered as a defensive lineman. Beyond that, the Steelers only have 4 quality defensive lineman on the roster as it stands today. If Daniel McCullers shows himself to be “serviceable” in 2019 then that will be an achievement. But it is not something the Steelers can count on. L.T. Walton did everything the Steelers had asked of him from the time the Steelers drafted him until 2017. He looked to be developing into a quality 5th defensive lineman. 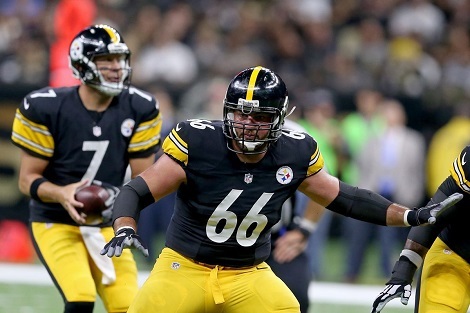 However, under Karl Dunbar he fell behind Daniel McCullers on the depth chart and remains unsigned. Therefore the Steelers defensive line draft needs in 2019 should be considered Moderate. Ask a fan, a journalist or even a team employee what the Steelers top needs are entering the 2019 NFL Draft and they’ll tell you inside linebacker, cornerback and wide receiver – probably in that order. Few would, or should argue. But after those positions, there’s little agreement over what comes next. Some would argue for edge rusher, others tight end while still others will insist that the Steelers add another safety. Those arguments all have their merits. Few, however, think of, let alone mention running back – is this a mistake? Let’s find out. Home town hero and cancer survivor James Conner became an immediate fan favorite when the Steelers picked the former Pitt Panther in the 3rd round of the 2017 NFL Draft. James Conner saw little action in his rookie season which unfortunately ended in the December showdown against the New England Patriots. James Conner’s body of work was so scant that the Steelers did not seriously consider him as an alternative to Le’Veon Bell. Nonetheless, with Le’Veon Bell made good on threats to hold out/backed away of his stated intention to report and play in the franchise tag (Bell made both), James Conner became the Steelers starting running back. James Conner proved to be up to the task as a quick look at his performance reveals. James Conner not only proved to be a capable replacement to Le’Veon Bell, by some measures, he was an improvement to Le’ Veon Bell. (One of those, unfortunately, was not ball security.) James Conner of course got hurt in the Steelers loss to the Chargers, but his return in week 17 should do nothing to dissuade fans that Conner is a championship caliber NFL running back. The other Steelers starter at running back would be Roosevelt Nix, their fullback. While Roosevelt Nix continued to play well when called upon by the Steelers, but in Randy Fichtner’s offense, Roosevelt Nix’s role decrease, as his 2018 snap count dropped to 9.86%, down from 16.37% in 2017. 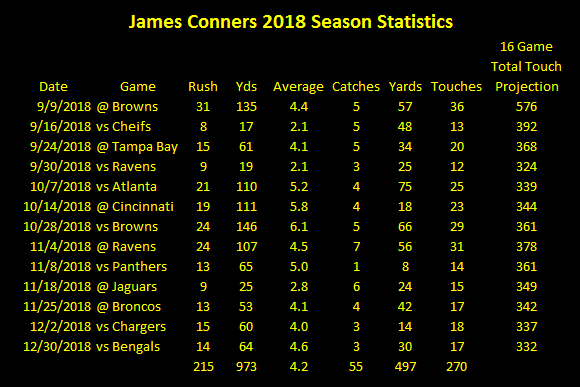 Behind James Conner the Steelers have Jaylen Samuels who was thrust into the starting role after Conner’s injury despite never having worked as a starting running back in his NFL life. Given his lack of experience, the rookie Jaylen Samuels did incredibly well, rushing for 256 yards on 56 carries and catching another 26 passes for 29 yards which included 3 through the air. Indeed, if you’re looking for an unsung hero from the Steelers 2018 win over the Patriots, it would be none other than Jaylen Samuels, who rushed for 142 yards. Behind Samuels, the Steelers also have Trey Edmunds, brother of Terrell Edmunds, who got activated from the practice squad when Conner got injured, and remains an unknown commodity. For those of you taking notes at home, the Steelers also have running backs Malik Williams and Ralph Webb on their roster. Although he only has a year of starting experience under his belt, James Conner already shares something in common with Willie Parker, Rashard Mendenhall, Le’Veon Bell, Isaac Redman and DeAngelo Williams. James Conner, like his Tomlin-era predecessors, suffered a late season injury that complicated “December football” for the Steelers because there was little proven depth behind him. To be fair to the coaching staff, as soon as it became clear that Le’Veon Bell’s holdout would become permanent, the Steelers dramatically cut down on his workload as the table above indicates. Perhaps that’s a sign that Mike Tomlin is learning that he shouldn’t take his credo of rushing a running back until his wheels start to fall off too literally. However, the Steelers made no apparent attempt to target a running back during free agency. And that leaves a bare cupboard behind James Conner and Jaylen Samuels. Steel Curtain Rising is already on record saying that beefing up running back depth is one of the under appreciated Steelers 2019 off season priorities. And with that in mind, the Steelers need at running back going into the 2019 NFL Draft must be considered Moderate High. The Steelers have boasted one of the most talented and productive receiving corps in the NFL in recent years, especially last season when both Antonio Brown and second-year sensation JuJu Smith-Schuster caught over 100 passes. But as the title of this article implies, Brown will not be on the team in 2019, thanks to his ugly and bitter divorce that ultimately resulted in a trade to the Raiders in exchange for a third and a fifth-round draft choice. In Smith-Schuster, who already has a Pro Bowl under his belt after also posting 1,426 receiving yards to go along with 111 catches, the question is, can he fill Brown’s very large shoes as the number weapon in Pittsburgh’s offense? Another question revolves around the receiving corps and whether or not Pittsburgh has enough weapons to complement Smith-Schuster. Lining up alongside Smith-Schuster as the number two receiver in 2019 is expected to be veteran Donte Moncrief, who Pittsburgh signed to a free agent deal in March. In five seasons in the NFL, Moncrief, 25, has 200 receptions for 2,543 yards and 21 touchdowns. Moncrief spent his first four seasons as a member of the Colts before signing a one-year deal with the Jaguars last offseason. Despite playing in Jacksonville’s anemic passing offense that included Blake Bortles at quarterback, Moncrief managed to catch 48 passes for 668 yards and three touchdowns a year ago. He had his best season in 2014 with Indianapoli, reeling in 64 passes for 733 yards and six touchdowns. This just so happened to be right before Andrew Luck was plagued by the injury bug. Beings that Luck has a quarterback pedigree much more in-line with Ben Roethlisberger, Moncrief may prove to be more productive for the Steelers. If any receiver figures to challenge Moncrief for the number two spot (at least prior to the draft), it’s second-year man James Washington, a second-round pick out of Oklahoma State last year. However, to say Washington’s rookie season was underwhelming is, well, an understatement, as he caught just 16 passes for 217 yards and one touchdown. Late in the season, Eli Rogers made his return from the ACL tear he suffered in the divisional round loss to the Jaguars the previous January, appearing in three games and catching 12 passes for 79 yards. But it was another young receiver who seemed to find a bit of a niche as a slot in Pittsburgh’s offense. I’m talking about Ryan Switzer, a return specialist that came to the Steelers in a trade with Oakland last summer. Switzer was targeted 44 times, catching 36 passes for 253 yards and a score. Rounding out the Steelers depth chart at receiver are virtual unknowns Ka’Raun White, Tevin Jones and Trey Griffey. Thanks to the Steelers free agent activity where they addressed needs at cornerback, inside linebacker and receiver, this might be a year where Kevin Colbert’s annual axiom of “Best player available” is the way to go. If that happens to be receiver–and if there’s a player whose value at number 20 exceeds that of linebacker or corner–it wouldn’t be a huge shock if that’s the direction the team goes with pick number one. The Steelers haven’t built their offense around the tight end position since the early 90s and the days of Eric Green. However, that doesn’t mean it’s not important. The cupboard is a little bare at the moment thanks to the free agent departure of veteran Jesse James, who signed a fairly lucrative deal with the Lions. Therefore, there’s no question Pittsburgh should draft a tight end. The real question is when? The Steelers often like to employ two starters at the tight end position, and even though he never put up huge numbers, Jesse James started 34 games over his final three years in Pittsburgh. Despite just starting seven games in 2018, James had his best season in terms of receiving yards with 423. James took on the role of the number two tight end a year ago, thanks to the emergence of Vance McDonald, who Pittsburgh acquired in a trade with the 49ers just prior to the 2017 regular season. Vance McDonald, 28, had by far the finest season of his career, tallying 50 receptions for 610 yards and four touchdowns. After several failed attempts, it looks like the Steelers have finally found a more than suitable replacement for the legendary Heath Miller. 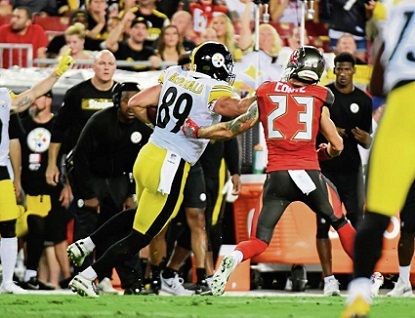 Not only that, but with his combination of size, speed and athleticism, Vance McDonald appears to give the Steelers the kind of weapon at the position that has tortured their own defense for years. Despite the 2018 coming out party of Vance McDonald, again, the Steelers are going to have to find a replacement for James. At first glance, Xavier Grimble, who will be entering his fourth season with Pittsburgh after turning pro in 2014, appears to be a decent candidate to assume James’ old role in the offense. At 6-4, 261 pounds, Xavier Grimble certainly has the size; he has also shown flashes of athleticism while catching 22 passes for 236 yards and three touchdowns. And, at 26, he’s obviously still young enough to evolve into a decent to better veteran tight end in the Steelers offense. 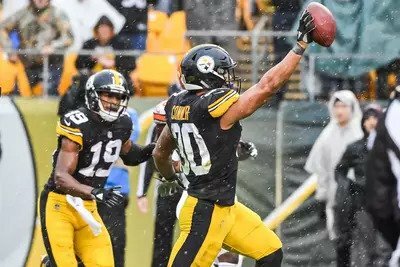 The question is, does Pittsburgh trust Xavier Grimble enough to promote him, especially after his boneheaded goal line fumble that turned a sure touchdown into a touchback early in what turned out to be a crushing loss to the Broncos last November 25? Behind Vance McDonald and Xavier Grimble are players named Jake McGee, Bucky Hodges and Christian Scotland-Williamson, none of whom have ever seen any game action in the NFL. McDonald still has three years remaining on a five-year contract extension he signed with San Fransisco at the end of the 2016 season. That means he likely has the number one tight end spot in Pittsburgh’s offense for as long as he continues to produce. Health is another matter as far as McDonald is concerned, as he suffered through a string of injuries prior to last season. Provided Vance McDonald stays healthy, he should be a reliable weapon in Pittsburgh’s offense for the next few years. But as I alluded to already, there’s clearly room on Pittsburgh’s depth chart for another tight end. Does this mean the Steelers should draft one in the first, second or even third round? Before you rule it out, remember that Pittsburgh just lost two of its biggest play-makers in receiver Antonio Brown and running back Le’Veon Bell. It wasn’t long ago that the drafting of receiver JuJu Smith-Schuster seemed like a luxury, while the selection of running back James Conner felt like a heartwarming story. Today, not only are both coming off of Pro Bowl seasons, they’re the two biggest weapons in Ben Roethlisberger‘s arsenal. Point is, if the Steelers have a shot at a talented and athletic tight end, it may not be the worst thing if they drafted him–even with a premium selection. Play-makers are play-makers, and the Steelers need to find them wherever they can. Therefore, the draft priority must be considered Moderate. Since the end of the 2019 season, the questions involving the “broken” Pittsburgh Steelers have been abundant. How can they get back to the old “Steeler Way?” How can Art Rooney II, Kevin Colbert and Mike Tomlin fix this broken situation, this national embarrassment? At least when it comes to their sources of bad PR. I look in my pretend pocket, and I find two receipts. 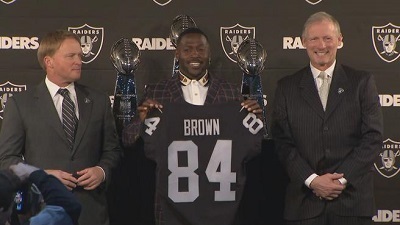 One documenting the trade of receiver Antonio Brown to the Raiders in exchange for a third and a fifth-round draft pick. The other one is for the transaction that allowed running back Le’Veon Bell to simply waltz into free agency and get the multi-year contract he always wanted–or at least get a multi-year contract with the Jets. The way I see it, Brown and Bell–often dubbed the “Toxic Twins” by both the media and the fans–were the headline acts of the circus that had been the Steelers the past few seasons. They were the players that gave use Facebook Live, bad rap songs, drug suspensions, off-the-field issues involving flying furniture and speeding tickets, Gatorade bucket tosses and camp holdouts. Brown and Bell were responsible for a great percentage of the non-football related questions — those so-called “distractions”–their teammates had to answer the past few years. So many people wanted Brown and Bell gone, and now they are. They are no longer going to be a problem for the Steelers. They are no longer going to be creating negative headlines (and even if they do–and even if they’re about the Steelers–they’ll be doing so in other locker rooms). What more can the owner, the general manager and head coach do to “fix” this problem, other than extract the problem children? I’ll tell you what they can do, they can draft people of higher character, something that has become a reality over the past few seasons. 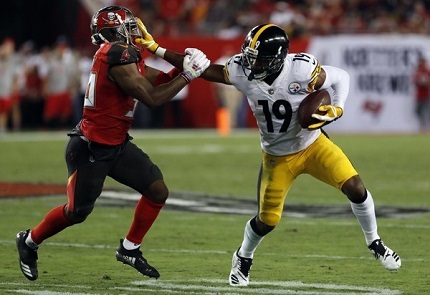 By selecting players like Sean Davis, Javon Hargrave, T.J. Watt, JuJu Smith-Schuster, James Conner, Terrell Edmunds and James Washington in recent years, Pittsburgh is clearly trying to organically change the culture of its locker room. This new draft philosophy is something that’s not unique to Pittsburgh, either. Mostly gone are the days when a team like the Rams would trade its franchise running back — Jerome Bettis — in order to make room to draft another running back — Lawrence Phillips — who was accused of the heinous crime of physically assaulting a woman. Today, if there’s even a whiff of poor character coming from a prospect’s draft camp, that player’s stock is likely to plummet to the point where he may not even be selected. No, this recent phenomenon of targeting great players with great character is not unique to the Steelers, but they have clearly hopped on board in a very noticeable way. Again, what more can be done? Do you want the people of authority to take a more disciplined, hard-line approach to running the team? Do you want Mike Tomlin, who has always been known as a coach who likes to treat his men like men, to become someone he isn’t? Or do you trust that these young men of great character will grow into veteran players who know what it takes to be responsible professionals, people who won’t embarrass the organization on a local or national level? Or, maybe, when talking about the “broken” Pittsburgh Steelers, you’re really referring to a lack of Super Bowl titles for the past decade. “If the Steelers were just a little more disciplined, they’d win it all,” is a popular sentiment among the faithful looking for reasons for their team’s failure to win that One for the Other Thumb. If you think getting rid of two All-Pro players will help that situation, then I guess we’re all about 10 months away from finding out. The 2019 Pittsburgh Steelers are no longer a broken organization, in my opinion–at least, as it pertains to having players in their locker room who will bring them bad publicity. Are they now fixed to the point where they’ll be able to win a title without two very talented problem children? In a move that has been excepted since January, the Steelers cut Morgan Burnett after the safety had spent just one season with the team. The Steelers signed Morgan Burnett during the 2018 off season as an unrestricted free agent to play strong safety. However, Burnett spent the bulk of his time playing dime linebacker, prompting him to tell the NFL Network he wanted his release. Most Steelers fans will remember Morgan Burnett for the play below. The Steelers were holding on to a slim lead against Oakland, and David Carr rocketed a pass down field to Seth Roberts. As you can see, both Morgan Burnett and Terrell Edmunds were there, but neither man made a play on the ball, and the catch set up the go ahead touchdown for Oakland. But should this one play define Morgan Burnett’s brief tenure a Steelers? In one sense, perhaps it was. Losing Ryan Shazier dealt a lethal blow to the Steelers defense in 2017. The Steelers defense carried the Steelers during the first half of 2017 while Ben Roethlisberger and Le’Veon Bell were slumping. The unit that was flashing very goodness, if not more, at midseason. 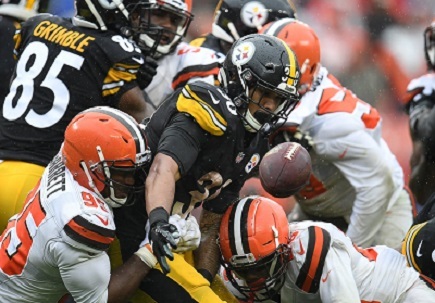 Losing Joe Haden exposed some weaknesses, and the Ryan Shazier’s spinal contusion knocked to bottom out of the defense. The Steelers attempted to bolster things by drafting Terrell Edmunds in the first round of the 2018 NFL Draft, signing Morgan Burnett and Jon Bostic. In many respects, the play pictured above symbolizes just how far short the Kevin Colbert and Mike Tomlin’s improvement efforts fell short. That photo of Burnett and Edmunds getting burned might be worth a thousand words, but it also doesn’t tell a complete story. While many Pittsburgh fans and many in the press might protest, the Steelers defense did improve in 2018. Just a few plays after the one depicted above, While Morgan Burnett deflected a sure touchdown pass intended for Jared Cook. The next week in the Steelers win against the New England Patriots, Morgan Burnett took his play to the next level. On 4th and 15 Tom Brady fired off a pass at Julian Edelman that Burnett defended picture perfectly. Game over. Steelers earn first win against Patriots since 2011. Those two pass defenses perhaps symbolize the progress the Steelers defense made in 2018. While players like Javon Hargrave, T.J. Watt, Joe Haden, and Sean Davis combined with Stephon Tuitt and Cam Heyward staying healthy all season did Morgan Burnett made his contributions when he finally got healthy. A lot of that improvement occurred under the radar, and its fair to say that Morgan Brunett’s role was under the radar. Regardless, he’s gone now. If Steelers Nation hoped that the Antonio Brown soap opera would end with Pittsburgh trading Brown to Oakland for 3rd and 5th round picks in the 2019 NFL Draft, they hoped in vain. Antonio Brown has kept the story alive, complete with released tapes of conversations between him and Drew Rosenhaus. Give Drew Rosenhaus credit for one thing: He knows how to shape a narrative. Outrage was the first reaction when news of Antonio Brown quitting on the Steelers before the season finale broke. Criticism of Mike Tomlin for creating this monster by empowering Brown because he didn’t run a tight enough ship followed. Most of those stories came out of Pittsburgh. “Unguarantees” shifted the slant of the story towards money. Brown’s motive, as many national and even Pittsburgh reporters concluded, was about money from day one. Yahoo! Sports Frank Schwab is taking it a step further by painting Antonio Brown as a victim. In an article published on Thursday March 28th, Frank Schwab expanded on Jeremy Fowler’s story that discussed concern around the NFL that the Steelers had set a bad precedent by trading Antonio Brown. And viola you have it! Antonio Brown is now supposed to be some sort of poster boy for cause of guaranteed contracts in the NFL. So the conclusion readers are supposed to reach is that had Antonio Brown’s contract been fully guaranteed he’d have behaved? This came after the Steelers made Antonio Brown the NFL’s highest paid receiver in 2017 (we’ll get to the guaranteed money below) and after Ben Roethlisberger targeted him more times than any other NFL receiver in 2019. Since he went AWOL at the end of the season, Antonio Brown has been the walking embodiment of narcissism. Oh, but ladies and gentleman, trust us on this one, if Art Rooney II had guaranteed his contract, none of this would have happened. Yeah, and if you believe that, I can get you a really good price on Pittsburgh’s Roberto Clemente bridge. I’ll sweeten the deal even more if you can give me cash up front….. The issue of the lack of guaranteed contracts in the NFL has been gaining traction of late. I may be an outlier, but I see the issue of guaranteed contracts in the NFL as complex than most. Certainly, given that they face a far greater injury risk, it seems outright unjust that NFL players play on non- guaranteed deals compared to their guaranteed MLB, NBA and NHL brethren. But how does the lot of NFL players’ job security compare to the rest of us, who work on an at will basis and can be let go at any moment? To be fair to Frank Schwab, later on in his article he makes it clear that he does not condone Antonio Brown’s conduct. But it is ironic that in trying to use Antonio Brown as a character in some sort of David and Goliath story about guaranteed NFL contracts he’s hurting his cause. “Guaranteed money is a term that has been thrown around a lot as the Antonio Brown and Le’Veon Bell stories have evolved. The Steelers stance of only guaranteeing the signing bonus and the first year of a contract has been savaged by the national press from about every angle possible. What no one ever mentions is that the Steelers stand by their word more than any other NFL team. NFL capologist Ian Whetstone has calculated that the Steelers pay 88% of their second contracts to home grown players. Moreover, percentage remains in the mid 70’s for Steelers 3rd and 4th contracts. That should put to rest any notion that Antonio Brown “had” to resort to such childish antics to secure financial security. Those who wish to root for Antonio Brown continue to excel as a Hall of Fame talent in Oakland are free to do so. But please, do not us the disservice of portraying Antonio Brown as a victim. As the hits keep coming in Pittsburgh former Steelers are not only sound off, but also changing their tunes. Recent comments by Emmanuel Sanders and James Harrison lending insight into the impact that context can have on memory. Surprisingly, Emmanuel Sanders’ comments haven’t gotten much play in Steelers Nation. Now, to keep Sanders’ quote in context, he further clarified, “I still remember the days there.” He also confided that Steelers coach Mike Tomlin said that the team wanted to keep him, but didn’t have the money. Tomlin, Sanders made it clear, wished him well. That’s important to remember. Because both Pro Football Talk’s Michael David Smith and Peter King put this into the context of an either/or situation between Antonio Brown and Emmanuel Sanders. That makes sense because they were both drafted in the 2010 NFL Draft, but a little bit of research will reveal that the Steelers gave Antonio Brown his 2nd contract in 2012, whereas Emmanuel Sanders didn’t become a free agent until two years later. If this were a Watch Tower column, and it is not, the we’d now take Smith and King to task for either ignoring context with contradicts Sanders’ claim and/or implying a backstory that doesn’t match the facts. We’d also remark on their failure to question Sanders’ quote from Colbert. Does anyone really think that Kevin Colbert used those words with Emmanuel Sanders? Tom Donahoe might have, but Kevin Colbert? The larger point is, that when Sanders first recalled his time in Pittsburgh, the Steelers were riding on a 6 game winning streak. Antonio Brown’s antics had been largely forgotten, and Le’Veon Bell’s hold out had become permanent. And people weren’t piling on Pittsburgh. Now they are. And it seems that Sanders has succumbed to peer pressure to join in. That might be overly harsh. Perhaps it is. Emanuel Sanders has been an objective voice when asked about issues relating to Ben Roethlisberger and Antonio Brown. He very well may remember his interaction with Kevin Colbert that way. But we’ve all been in situation when everyone is coming down on someone else, and we’ve all known how easy it is to join in. If that seems to be the case with Sanders, James Harrison is taking the opposite route. Hey, at least throw a pick on their side of the field instead of asking the D to bail you out again. Or hand the ball off and stop trying to act like Peyton Manning. You ain’t that and you know it, man; you just get paid like he does. In subsequent radio interviews, implied that those comments were only the tip of the iceberg in terms of Harrison’s feelings about Ben Roethlisberger. Why the change? Who knows? 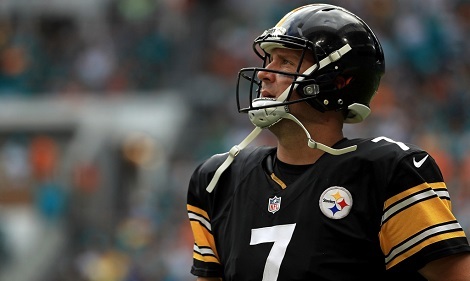 Since 2011 Ben Roethlisberger has, in many ways, taken the team on its back and been the primary person responsible for the 8 non-losing seasons the Steelers have enjoyed since then. Perhaps James Harrison, the ultimate underdog, feels compelled to do one of the things he does best: Swim against the stream. Could this be a turning point in James Harrison’s relationship with the Steelers? Time will tell. But with everyone piling on Pittsburgh, James Harrison is deciding not to take part. Good for him.